Cistern will catch water to be reused to irrigate Sahalee Park's lawn at night. 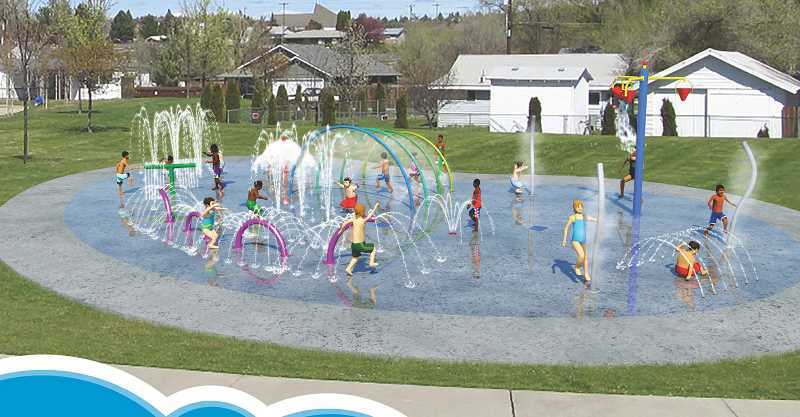 Thanks to a large grant from the Oregon Parks and Recreation Department, the Madras spray park is expected to be in place next summer. "This specific grant is federal funds, and goes through the National Park Service," said Michele Quinn, office coordinator for the Madras Public Works Department, noting that the city was tentatively approved for $250,000 for the project. "We won't officially hear back from them until about October." "The need for the splash park was identified in the 2005 refinement plan of the parks and open space master plan of 2004," said Public Works Director Jeff Hurd. "Unfortunately, at the time when we did the expansion to Sahalee, we fell short to install the spray park, but it wasn't forgotten." The pavilion, memorial and realigned parking, other elements of the original plan, were completed in 2009, but funding for the spray park was more difficult to acquire. A couple years ago, Hurd said he was approached by the Bean Foundation and KEITH Manufacturing, both of which wanted to make the spray park a reality, "and it just started to snowball after that with commitments from various businesses and other community members to help fund it." In early 2017, the Bean Foundation and KEITH Manufacturing each donated $45,000, and the Madras Redevelopment Commission, another $10,000 toward the original estimated cost of $275,000 for the spray park. "It really is awesome to see the community come together to make this project a reality," said Hurd. Armed with matching donations, on April 12, representatives of the city went to Salem to present their proposal to the Oregon Parks and Recreation Department. Instead of retrofitting the city's stormwater pipes to accept the water from the spray park, the OPRD committee suggested a cistern and other improvements to the city's plan. "They offered additional funding to do upgrades," said Quinn. "Before our initial grant, we didn't have any type of water-retention system. This will have a 20,000-gallon cistern; water will run into that and we'll be able to irrigate at night with that." With the grant, "We're going to redo some of our ramps and around the restroom to make them ADA-accessible," she said. "Also, we will have sidewalk to the spray park, so that someone with disabilities can use it." About a month after the city's presentation, representatives from OPRD visited Madras and toured the park. "That's when they offered the additional funding, if we could come up with the other 50 percent," she said. "The initial cost was $275,000; now we're at $500,000, with all the additional features," she said. "Right now, we need $10,000-$15,000 for our 50 percent; all of that has come from business owners and private citizens." Plans for a cistern will make the project much more sustainable. "It will be huge; instead of the water we would have used, which would more or less have gone down the drain, now we'll be able to use it to water Sahalee Park. The kids will just to get to play in it first, essentially." Once the grant is formally awarded in the fall, the city will go through a design period. "We're hoping to have that done by January, and then we'll put it out to bid. We'll build in the spring, and we are shooting for early summer to have it open and running." The spray park will be located on the C Street side of the park, just east of the playground. With 2,810 square feet of play area, the spray park will contain approximately nine aquatic play features. "It will have a touch-and-go system, so it won't run all the time," said Quinn. "Kids will have to hit a button, so we're not wasting water. There will be two or three zones, each with a button." The city will have the ability to program the system to increase the water flow during hot, busy times, or decrease it during cooler times. The spray park will provide an interactive space for everyone from toddlers to teens. "One of the big needs that I keep hearing through the grapevine is that we need a place for the downtown that is free and accessible to all community members," said Hurd. "That was enough for me to keep pushing on it making it happen. And now, come spring/summer of next year, Madras will have an awesome addition to Sahalee Park that's free and accessible for all."